As you probably know by now, I legitimately have an obsession with my Instant Pot. It seems that I’m pumping out at least one new recipe a week using it. But, I’ve yet to make some of the beef dishes that the Instant Pot is best known for – dishes like pot roasts, and beef stew, those that use tough cuts of meat that would traditionally need to cook away all day in order to transform into a more delicious and tender version of themselves. So, last weekend, I set out to change all that, with this Instant Pot Persian Beef Stew. It’s like beef stew’s exotic, spicy cousin – spiked with lots of yummy spices like cumin, cinnamon. 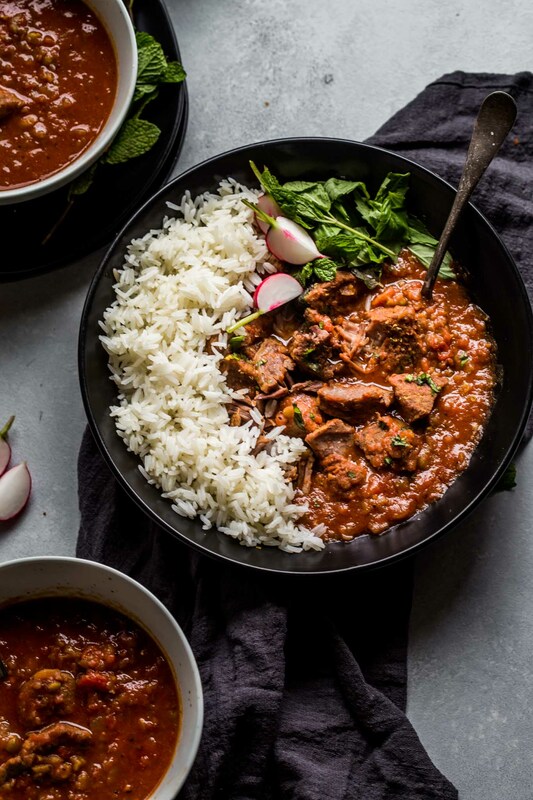 saffron and tumeric, but it’s also a much more hearty (and healthy) version of the original version too because this Instant Pot Persian Beef Stew gets plenty of fiber and vitamins from the split peas that are in this stew too. I loaded this recipe up with a good cup and a half of split peas. As they cook away in the Instant Pot, they take on the most silky texture and absorb all those savory, warming spices. 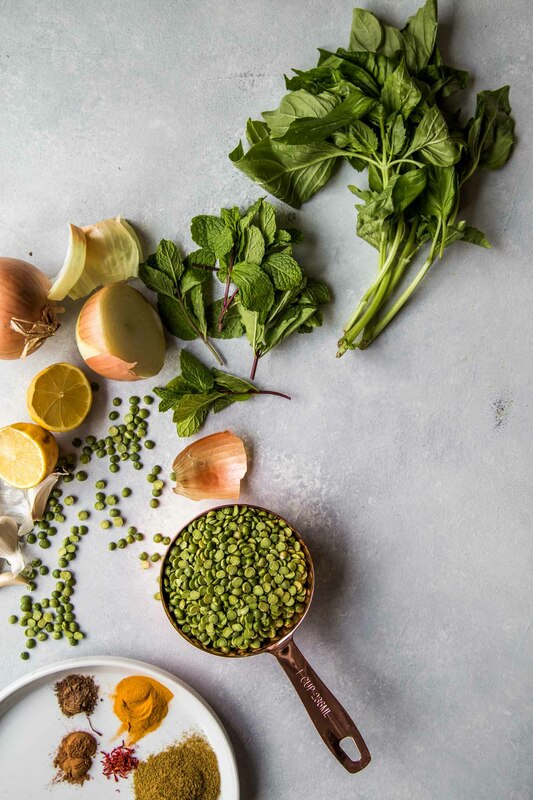 Split peas are part of the superfoods category called “pulses” – the dry, edible seeds of plants in the legume family, which also includes chickpeas, lentils and beans. They’re naturally high in protein and fiber, but low in fat. And, if you’re looking for ways to eat healthier, sneaking pulses into your daily routine is definitely a great way to do it. This recipe starts by sauteing cubes of beef right in the Instant Pot – That’s one of my favorite features – I love that you can saute and cook all in the same pot. But, be sure to cook your beef in batches so that you don’t overcrowd the pot. Overcrowding means that your beef won’t get browned, instead it will steam itself. Once the beef cubes are all browned, set them aside and add the onion and garlic to the pot, letting it soften for a few minutes. Then add in the tomato paste and let it get nice a browned too. Once it takes on that color, add in your stock and scrape up all those browned bits from the bottom of the pot. 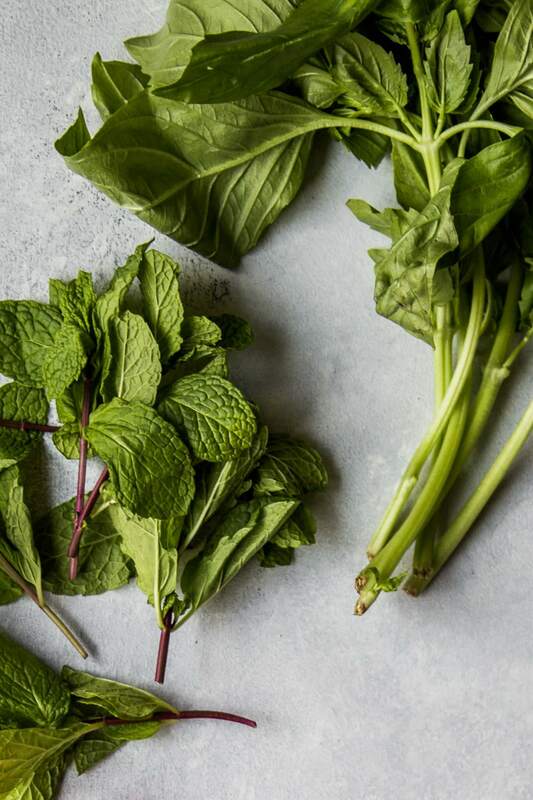 If you skip this step, the Instant Pot might not come to full pressure. I used my homemade slow cooker bone broth as the stock (I had it on hand in the freezer), but you can swap it out for some boxed chicken or beef broth too. Add in the split peas, tomatoes and all those amazingly fragrant spices, then give everything a good stir. Place your lid on the Instant Pot, make sure it’s set to seal, and cook on high pressure for 25 minutes. It will take about 15 minutes for the pressure to build and then the countdown timer will start. After the time is up, let the pressure release naturally for 15 minutes, do a quick release to release any remaining pressure and remove the lid. I added in the juice and zest of one lemon to brighten up this stew. You’ll also want to taste for seasoning and adjust with more salt and pepper as needed. 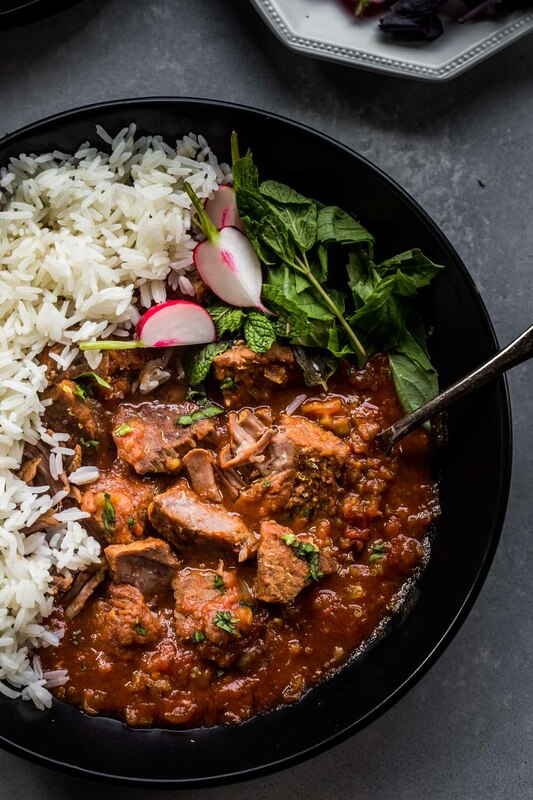 Serve this yummy Instant Pot Persian Beef Stew in bowls topped with fresh basil and mint, accompanied by some basmati rice, and maybe a glass of red wine too (see my recommendations below). Pat the stew meat dry and season well with salt and pepper. Set Instant Pot to SAUTE, add vegetable oil and brown the meat on all sides. Meat will not be cooked through. (Be sure not to crowd the pot - you may have to work in batches). Transfer browned meat onto a plate. Add onions and garlic and sauté for a minute or two then add the tomato paste and saute for 1 minute longer. Pour in the broth and scrape up any browned bits from the bottom of the Instant Pot. Return the beef to the pot and add in the split peas, crushed tomatoes, and spices. Cover and seal the lid - turn the vent to sealing. Hit CANCEL then press the MANUAL (high pressure) button and set the timer to 25 minutes. It will take about 15 minutes for Instant Pot to come to full pressure, then the display will show a countdown timer. Once the 25 minutes are up, allow the pressure to release naturally for 15 minutes, then release any remaining pressure. Open the lid, stir in the lemon juice and zest and season with additional salt and pepper, if needed. If you loved this Instant Pot Persian Beef Stew I would appreciate it so much if you would give this recipe a star review! Also, be sure to snap a picture of your finished dish and share it with me on Instagram using the hashtag #platingsandpairings and tagging me @platingsandpairings. Try a Cabernet, Merlot or Syrah with this hearty and well-spiced beef stew. 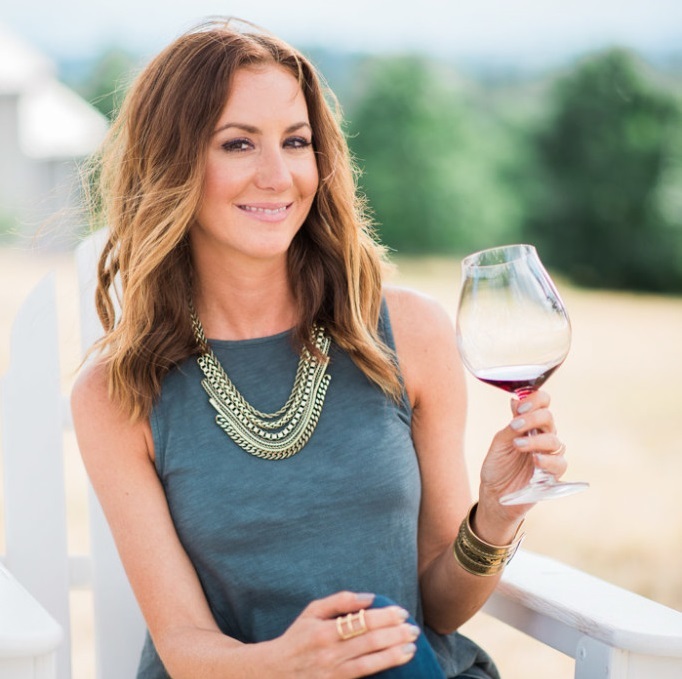 Or, look for a red wine blend that combines those varietals, especially those coming from the Washington wine region. This sounds fantastic! I just got an Instant Pot the other day and have been thinking about how to use it – this may be the first recipe I make! I will have to pair it with rice prepared the Persian way, so that it gets that wonderful tahdig on the bottom. Yay!!! I’m so excited you got an Instant Pot – You will LOVE it. Here’s another one of my favorite Instant Pot recipes. I hope you give it a try Mary – I would definitely be amazing in a Dutch oven too! I’m also in the no-Insta-Pot-have-to-use-my-old-Creuset-Dutch-Oven camp. I’m thrilled you found a Persian recipe, years ago friends of ours would invite us to Persian New Year celebrations and the food made me swoon, it was so good. That sounds like an amazing celebration to be a part of Ellen! Definitely Megan – I use mine constantly! I hope you do Natahsa – I really do use my Instant Pot ALL the time! Oh wow! This sounds like a perfect way to get out of the traditional winter stew rut. Love the addition of split peas. I love that the split peas add it a bunch of nutritional benefits too! I love the sauté feature in the IP as well! Makes it so easy! This stew looks tasty. 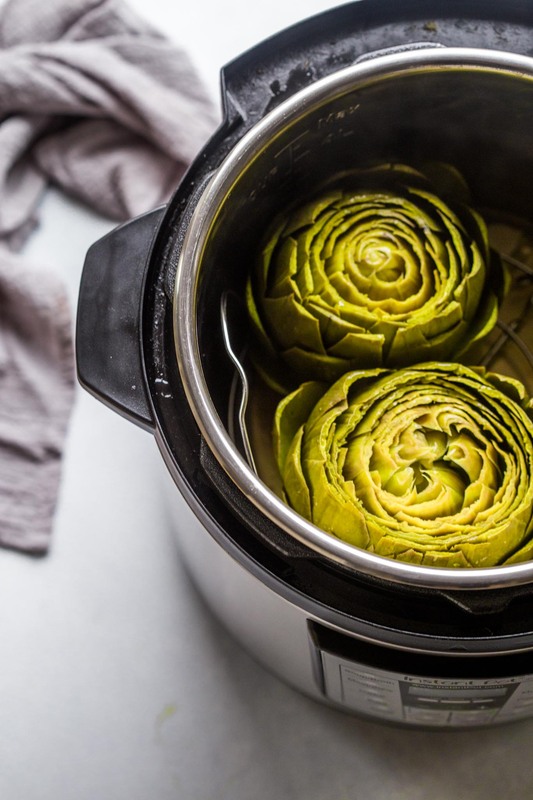 Isn’t the Instant Pot so handy? Love it! 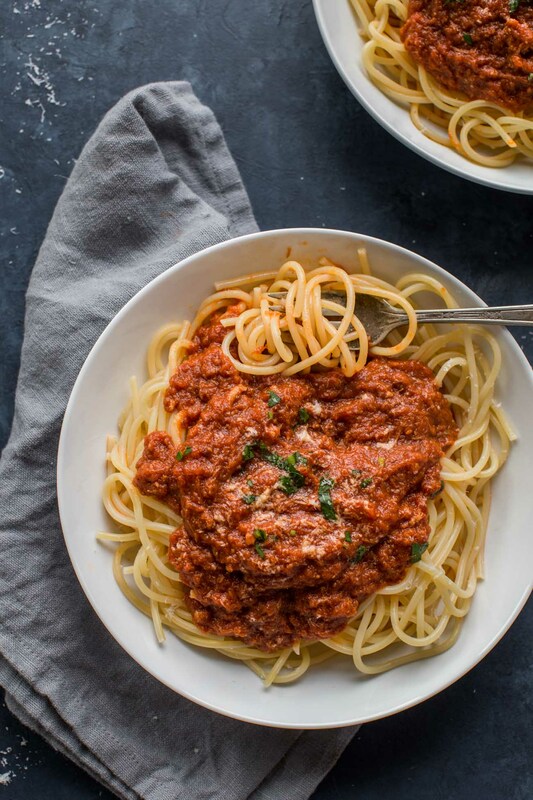 I am so unbelievably obsessed with my Instant Pot that I had to put it away for a little while, which I’m not sure why I think that is a bad thing, but oh how this recipe is tempting me to bring it back out! I am so obsessed that I caved and bought TWO Instant Pots now! It’s crazy how much more I use it than I thought I would! Gonna try it this week! Can this be made with lentils instead of split peas? Hi Jeffrey – You can definitely swap in lentils for the split peas. Same cooking time. This is exactly the kind of dish that makes me want to get an Instant Pot. So perfect for this wintery spring day! Thanks Jean – I’d highly suggest investing in an Instant Pot. After being a skeptic for a while, I now own two of them I use them so much! OH MY GOODNESS!! This dish was amazing!!! I absolutely loved how the lemon took it to a whole new level! Thank you!! This is the first recipe I’ve tried from your site and won’t be the last! Next time, there will be a next time, I will add more meat for my son and husband. Thank you again! Thanks so much for the kind words Jen! I’m so happy to hear that you and the family loved the recipe. This was wonderful made with split yellow peas. This recipe was really delicious! I used green lentils instead of the split peas, because that is what I had on hand. It was hearty without being too heavy. Thank you for this recipe! 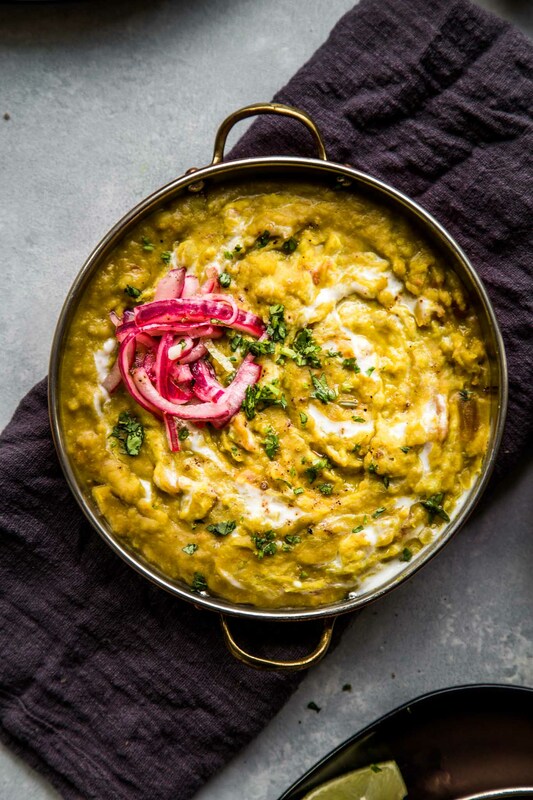 I love that substitution Belinda – Lentils are one of my favorites. So happy to hear that you enjoyed! Unfortunately my family did not like this dish. The flavors were ok, but the texture was off putting for us. Bummer! So sorry to hear that Patti! What about the texture did you not like? Was it the peas, or the beef? My beef turns out extremely tender in the IP, and I love that! Saffron is SO expensive! This stew will definitely still be delicious without it. It still has a ton of flavor going on. This was really good! I didn’t have saffron so I added another 1/4tsp of Turmeric. Turned out great! Will definitely make again. Thanks for sharing this delicious recipe! PS- To some of your readers/commenters: It isn’t really fair or accurate to give a star rating to a recipe you haven’t yet made or tried. While the pictures and ingredients may lead you to believe something is delicious, it’s like reviewing a book you’ve only read the cover of, which is misleading. I’m going to try this tonight! Do you think I can swap the split peas for lentils? Hi Monica – Yes, that should work! The cook time can probably be kept the same too. Hi Jennifer – I would assume that would be tasty as well! I’d love to hear how it works for you!!! I may give it a try too. Lost me at legumes. My whole adult life … well post party phase adult life … I subscribed to the low fat high fiber version of “healthy” eating. Going Paleo has changed me forever. I’ve shed ten years in just a few months. My waist is slimmer, my biceps are bigger, my brain is brawnier, my skin glows. I can’t be superlative enough about the difference it’s made. People notice. They’re like, have you been working out? Haha. No. Just pigging out on high fat foods sans gluten, dairy, legumes, sugar or processing. Basically. But I can already see how to do a Paleo version of this. You can get silky with cashews I’ve found. I enjoyed your verve. I just made this for the first time last night and it was fabulous! I did substitute lentils for the split peas as I didn’t have any split peas in my pantry. The meat was perfectly tender and the lemon juice at the end brightened the whole dish up making it feel light and refreshing for a stew! This was my first time on your site and I will definitely be back for more inspiration! I’m so glad that you liked it Samantha! Thank you for the kind words. I can’t wait to try it out with lentils too! Tried the recipe today. Followed everything per recipe but 4 cups broth made the stew too watery which diluted the taste. Will try again with 2 cups broth and see if that helps. Meat was very tender though! My split peas turned to soup..the flavor of the stew was perfect. Am I using the wrong kind of split pea? I would like them to stay whole and not turn to mush. Any thoughts? Hi Shaza – The split peas in this recipe are going to turn to a silky texture after cooking under pressure. If you would like the legumes to have a bit more of a bite, you could try swapping in some brown or green lentils. Hope that helps!